Pouring a thick coating of epoxy onto a table top can produce a unique effect. With a ¼” thick coating you can cast a variety of objects in the epoxy for decorative accents. Coins, fabrics, sticks of wood, memorabilia and photographs have been used in this decoupage application. Here are a few tricks to make things go more smoothly. Photographs will darken when wetted with the epoxy. They should be glued down first with a “white” glue to hold them in place and to prevent curling when wetted with the epoxy. Porous materials like burlap trap a lot of air and are more susceptible to bubble related problems than are items like coins. For a sealer coat, figure 40 square feet per pound of mixed material. For a typical flow coat over a sealed surface, about 1/8″ thick, figure 0.75 pounds per square foot—Group size A of resin and hardener weighs 3.11 pounds. Use this to estimate how much to buy and to mix depending on the desired thickness and the area to be covered. For best clear finish applications, use WEST SYSTEM 207 Special Clear Hardener with 105 Resin. Warm the resin and hardener before dispensing to about 75ºF to reduce viscosity. Dam the perimeter to prevent drainage. Duct tape around the bottom edge of the table top will prevent the epoxy from dripping. For coatings ¼” thick, tack a piece of stock molding with 6 mil plastic under it around the table’s perimeter. Be sure the table top is level. Bubbles trapped in the coating are usually not desirable. To avoid the bubbles resulting from outgassing, it’s best to seal the substrate before pouring the thicker coating. Allow the substrate temperature to stabilize. (Expanding air will be expelled from the material as its temperature rises) First apply a thin coat of epoxy to the substrate and allow it to tack up. Pour the thick coat before the epoxy is tack free. Poke a ¼” diameter hole in the corner of a clean plastic mixing pot, such as our 805 poly mixing pot or a margarine tub. For a larger project use a coffee can. Place duct tape over the hole. Mix the resin and hardener thoroughly, allow it to stand about one minute, so the bubbles rise to surface. Peel back the tape covering the hole and allow de-aerated epoxy to flow onto the table surface. 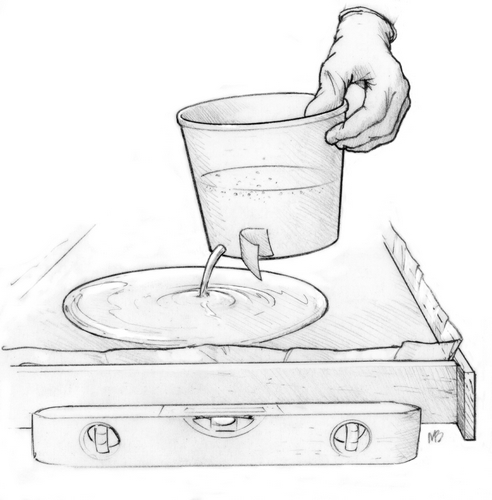 Pour close to surface so material does not splash or create air upon striking the surface. Stop the hole with tape when the container is nearly empty—so bubbly epoxy isn’t poured onto surface. If bubbles occur (most likely around objects and porous material) pass a hair dryer over the surface to temporarily reduce viscosity and allow the bubbles to rise and burst. The hair dryer also helps it to self level. Be careful not to overheat it. It’s always a good idea to practice a technique like this on a smaller scale, before encapsulating valuable or one-of-a-kind objects. When cured, wipe the surface with furniture wax for a lustrous finish. Be careful to use coasters with very hot beverages, as excessive heat can stain the coating. Scratches in thick coatings can be buffed out with a buffing compound. Mixing—If 301 Mini Pumps dispense too slowly you can mix the epoxy by volume. Refer to the hardener label for the correct ratio for mixing by volume. When working with larger volumes of epoxy, keep in mind the shorter pot life ad risk of exotherm. Breaking Bubbles—You can also break bubble on the surface of fresh epoxy by passing the flame of a propane torch quickly over the surface. Hold the tip of the flame just above the surface and keep it moving (about 3 feet per second). In this case it is CO2 from the combustion rather than heat that breaks up the bubbles. Use care and, if you can, practice first. This entry was posted in Furniture and tagged #11, Captain James R. Watson, epoxy bar top, Epoxyworks #11, pouring epoxy, Spring 1998 on July 22, 2014 by ewadmin.